SF Guitarworks is hosting a donation drive for Bay Area Girls Rock Camp from now until November 30th. Check out BAGRC’s wish list below to see if any gear (or other items) you have are a match, but any working gear would be appreciated. Bring any donations by the shop and we will deliver all items collected to the BAGRC, along with a fully Plek’d and setup Fender Telecaster. RSVP on Facebook here! Used Smartphone, IPad or Tablet: These useful contraptions let us record footage during band practice and camp, publish media, share awesome video clips and songs with campers, and help us sell merch! Pick up & Delivery People: Food donations feed our volunteers during camp, but it’s often difficult for a staff member to pick up the donations while we are running the program. So. . . We LOVE it when people can pick up and deliver donations to our program. Videographers + Photographers: Help us record the showcases! We need photographers and videographers to record the showcases, edit and upload each song. Air miles to offset the cost of sending staff members to the annual GIRLS ROCK CAMP ALLIANCE (GRCA) conference. Food/beverages/snacks: We provide snacks for all our participants, full breakfast and lunch for our summer camp volunteers, and 3 meals a day for our Women’s Rock Campers. Donations of catered meals, restaurant discounts, beer & wine (for events), snacks, coffee & tea are greatly appreciated. Auction prizes: We hold silent auctions at many of our public events as a way to raise funds. Auction prize donations can include gift certificates (for massage/body work, restaurants, tattoo shops, music lessons, etc. ), handmade crafts, creative services (people have offered singing telegrams, customized original songs, birthday party entertainment, etc. ), artwork, concert tickets and more. Massage + Bodywork: We love our healers to much we are saying this twice! Massages and bodywork can come into the program to work on our volunteers. Donate as a gift to the staff or auction off your services as an auction item. And the big one. . . A PERMANENT SPACE: We are in search of a space to call our own, preferably in or near downtown Oakland. In our dream space, in addition to our current programs, we would offer affordable group and private lessons, practice spaces for bands, ongoing workshops, a year-round community space for girls, recording and performance opportunities, and lots more. If you would like to donate a building to us, or have any leads on affordable spaces to rent, please get in touch! 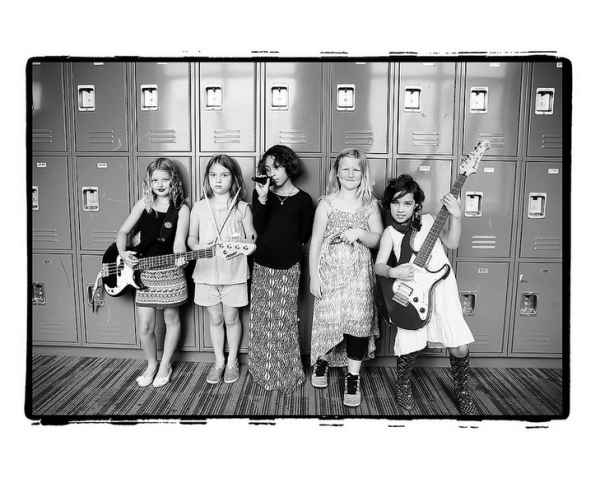 Bay Area Girls Rock Camp is a nonprofit organization that empowers girls through music, promoting an environment that fosters self-confidence, creativity and teamwork. BAGRC challenges gender stereotypes, encourages collaboration and tolerance among peers, and provides a comfortable space for people of all backgrounds to express themselves. Through music lessons, workshops, group activities and performance, girls acquire skills that help guide them throughout their lives. You can read more about the BAGRC here: www.bayareagirlsrockcamp.org.